Due to external air pollution by ozone, leaf injuries of the ozone-sensitive clone of white clover were visible in Ljubljana, Rakičan pri Murski Soboti and Iskrba pri Kočevski Reki in the period 2000-2007. The indicator shows the intensity of leaf injury of ozone-sensitive (S) and ozone-resistant (R) clones of white clover (Trifolium repens L. 'Regal' NC-S, NC-R), which were in the period 2000-2007 (April – October) exposed to ozone in three testing sites – in Ljubljana, Iskrba pri Kočevski Reki and Rakičan pri Murski Soboti. The leaf injury of resistant (R) and sensitive clones (S) is indicated. The percentage of the leaf injury was assessed weekly on plants being cultivated in pots (20 pots of each clone) by simple scale, harmonised within the framework of the ICP-Vegetation programme. 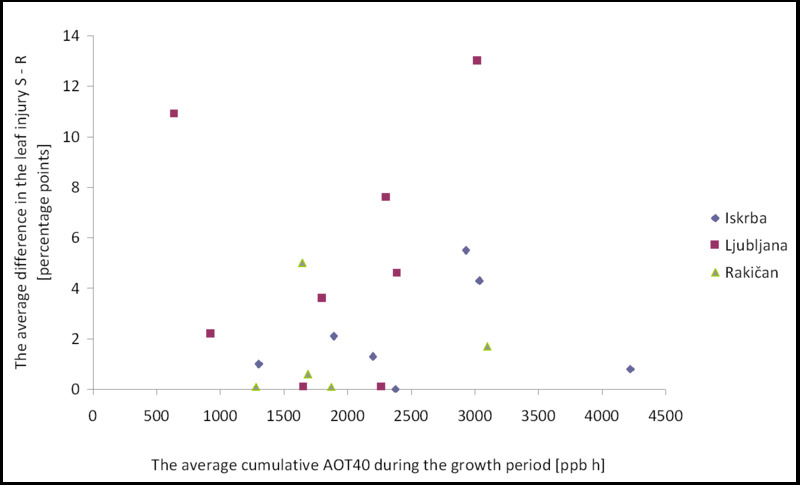 For the comparison of the leaf injury of indicator plants by ozone and AOT40 measurements, intended for the monitoring of the vegetation and forest damage due to air pollution by ozone, the indicator shows also the dependence of the average difference in leaf injury of the ozone-sensitive (S) and ozone-resistant (R) clone of white clover (in %) from the average cumulative AOT40 during the growth period (between successive harvests) in the period 2000-2007. For the determination of the harmful effects of ozone on vegetation, ozone-sensitive indicator plants were selected within the framework of the ICP-Vegetation programme, implemented within the framework of the working group for effects under the auspices of the Convention on Long Range Transboundary Air Pollution (WGE CLRTAP). The harmonised experiment for the monitoring of the effects of ozone with ozone-sensitive (S) and ozone-resistant (R) clones of white clover (Trifolium repens L. 'Regal' NC-S, NC-R) was conducted for the longest period of time within the framework of the EU countries, and also other signatories of the LRTAP Convention. Monitoring and reduction of negative influences of ground-level ozone on vegetation. Increased concentrations of ground-level (tropospheric) ozone, entering through stomata into plants, cause irreversible tissue injury, which is indicated primarily in the form of point necrosis in leaves, the reddening of leaves and premature ageing and dying of plants. The consequences of injury are a reduction in growth and total biomass of plants, which is also reflected in the decrease of crop yield in agricultural plants. In the Figure ZR14-1 no reduction or increase trends of the leaf injury are noticeable in the period 2000-2007, since the concentration of ground-level ozone and its effects are highly dependent on meteorological conditions (intensity of solar radiation, temperature, precipitation, air humidity, etc. ), which strongly change in individual years. The high values of AOT40 are connected with high releases of ozone precursors and high levels of radiation, which is usually also connected with higher temperatures and smaller relative air humidity. With regard to this, 2003 especially stands out when the AOT40 values were the highest. 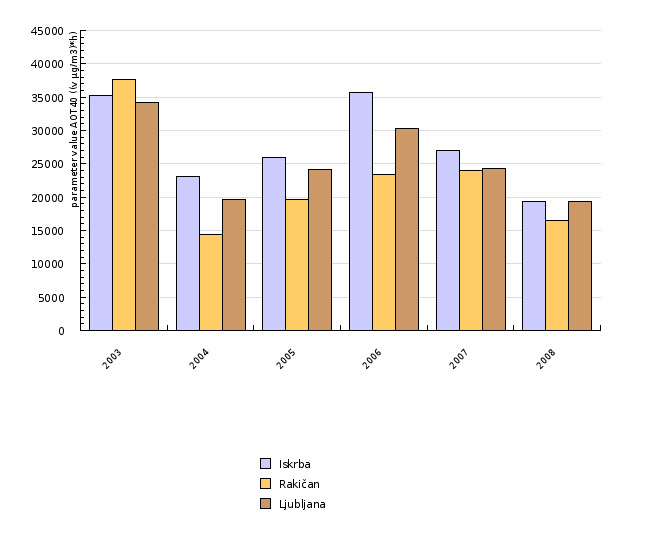 Correspondingly, the average leaf injury of the ozone-sensitive clone was also the highest that year at Iskrba pri Kočevski Reki. In Ljubljana and Rakičan pri Murski Soboti, this interaction is not so obvious, most likely due to the instantaneous inflow of nitrogen oxides from traffic in the vicinity; namely, the latter also consume the generated ozone. Another reason for the disparities between the measured high values of AOT40 and leaf injury are the already indicated climatic conditions, which influence the openness of stomata and the possibility of the occurrence of injury. The increase of cumulative values of AOT40 in the period of 28 days between individual harvests of clover clones also increases the difference in the level of leaf injury to ozone-sensitive and ozone-resistant plants. Already in the first half of the vegetation period at all three places, where the indicator plants were exposed - Ljubljana, Iskrba in Rakičan, the AOT40 values exceeded the cumulative values, determined within the framework of harmonised research by the ICP-Vegetation programme; namely, for agricultural plants 3000 ppb h in 3 months (effect: reduced crop yield); ornamental plants 6000 ppb h in 3,5 months (effect: reduced crop yield); semi-natural vegetation (permanent grassland) 3000 ppb h in 3 months or the growing season (effect: reduced growth of perennials and reduced generation of seeds in annuals ); forest trees: 5000 ppb h in the growing season (effect: reduced growth). Despite the high AOT40 values (Figure ZR 14-3) and exceeded thresholds for all vegetation types the injuries of indicator plants was relatively small (Figure ZR 14-2). The measurements did not show any difference in average biomass of ozone-sensitive (S) and ozone-resistant (R) clones of white clover. This shows a relatively bad responsiveness of this indicator plant and not the best indicator value of AOT40 for the definition of damage to vegetation due to ground-level ozone namely the state of plants and environmental factors (especially the water regime) may strongly modify the effects of ozone. This is confirmed also by a one-season experiment with the same indicator plant at Krvavec in 2001, where the effect of relatively high concentrations of ozone on the reduction of biomass in ozone-sensitive plants was high in more humid atmosphere (40 % reduction with regard to the ozone-resistant clone), which was not determined in the same year at other measuring stations (Ljubljana, Iskrba, Rakičan). Due to such problems, ICP-Vegetation programme participants are conducting new research on the effects of ozone, determining its impact on plants on the basis of stomata conductivity of indicator plants. Objectives summarised by: According to the ICP Vegetation programme, which is implemented within the framework of the Convention on Long Range Transboundary Air Pollution, CLRTAP. Source database or source: Data of the Chair of Applied Botany, Plant Ecology & Physiology and Informatics, Agronomy Department, Biotechnical Faculty, University of Ljubljana. Methodology and frequency of data collection for the indicator: The share of injured leaves of indicator plants and intensity of their leaf injury is assessed weekly. The data series is available for the period 2000-2007 for this particular indicator (white clover). The presentation of data is periodic. Within the framework of the ICP-Vegetation programme, the use of white clover clones as indicator of different sensitivity to ozone was concluded. In the last two years – 2008 and 2009, other bio-indicators are being tested, ozone-sensitive and ozone-resistant biotypes of kidney beans; however, the data for this bio-indicator has not been entirely processed yet and the testing of its responsiveness is still being conducted. Methodology of data consideration: The determination of ozone induced injuries to plants is conducted by signatories of the LRTAP Convention within the framework of protocols, which were prepared by the ICP-Vegetation programme on the basis of preliminary fumigation experiments with ozone. The programme coordinator selects an indicator plant, cultivated in accordance with the prescribed protocol by all programme participants, who also, following the harmonised method, record the injuries of leaves and reduction of biomass, and perform other research on the plant, which would prove the ozone injury and reactions of the plant. In vegetation seasons 2000-2007, we exposed indicator plants of white clover at three experiment sites, in Ljubljana, Iskrba and Rakičan, which are located in the vicinity of meteorological measuring stations, measuring hourly concentrations of ground-level (tropospheric) ozone as well as other meteorological parameters. At each site, 20 ozone-sensitive and 20 ozone-resistant plants of white clover were planted in self-irrigation pots; the plants were harvested every 28 days to a height of 7 cm above ground. Before harvesting, once a week in each pot of white clover the percentage of leaves injury was assessed following the scale: 0 – no leaf injury, 1 – very slight leaf injury, 2 - 1-5 % slight leaf injury 3 - 5-25 % moderate leaf ijury, 4 - 25-50 % heavy leaf injury, 5- 50–90 % very heavy leaf injury and 6 - 90-100 % total leaf injury. Advantages of the indicator – monitoring of the negative effects of tropospheric ozone directly in plants. The data, used for the preparation of this indicator, was sent to the European database ICP-Vegetation coordinator (Centre for Ecology & Hydrology, Bangor, UK) and was as such part of an international data exchange within the framework of the LRTAP Convention, while also being processed in international comparisons. Disadvantages of the indicator – substantial subjectivity of the assessment of leaf injuries, performed by different assessors. •Batič F., Turk B. 2007. Strokovne podlage za izvajanje Konvencije CLRTAP in Programa ICP-Vegetation v Sloveniji v letu 2006-2007 Poročilo za leto 2006. Ljubljana, Biotechnical Faculty, Agronomy Department: p. 16-20. •Batič F., Turk B. 2007. Strokovne podlage za izvajanje Konvencije CLRTAP in Programa ICP-Vegetation v Sloveniji v letu 2006-2007. Poročilo za leto 2007 in končno poročilo projekta. Ljubljana, Biotechnical Faculty, University of Ljubljana: p. 4-33. •Benton J., Fuhrer J., Gimeno B. S., Skarby L., Balls G., Palmer-Brown D., Roadknihgt C., Saders G. 1995. ICP-Crops and critical levels of ozone for injury development. V: International workshop: Exceedances of critical loads and levels. Vienna, November 22-24, 1995: p. 1-5. •Bienelli A. 1997. Vpliv fotooksidantov na rast in razvoj izbranih vrst kmetijskih rastlin na območju Zasavja. Diplomsko delo. Ljubljana, Biotechnical Faculty, Agronomy Department: p. 36-39. •Džuban T. 2002. Indikacijske vrednosti klonov plazeče detelje Trifolium repens 'Regal' ('NC-S', 'NC-R') za sledenje fotooksidantov v Sloveniji. Diplomsko delo. Ljubljana, Biotechnical Faculty, Agronomy Department: p. 43. •Harmes H., Mills G., Hayes F., Jones L., Norris D., Fuhrer J. 2007. Air pollution and vegetation. ICP Vegetation annual report 2006/2007, Bangor, University of Wales, UK: p. 37. •Hayes F., Mills G., Harmens H., Norris D. 2007. Evidence of Widespread Ozone Damage to Vegetation in Europe (1990-2006). Programme Coordination Centre for the ICP Vegetation, CEH Bangor, UK: p. 26. •ICP Vegetation Experimental Protocol for the 2001 Season. 2001. Working group on effects, ICP Vegetation Coordination Center, UK: p. 2-15. •Jurkovnik M. 2001. Metode ugotavljanja vpliva onesnažil iz prometa na kmetijske rastline. Diplomsko delo. Ljubljana, Biotechnical Faculty, Agronomy Department: p. 35. •Kopušar N. 2009. Spremljanje kazalnikov oksidativnega stresa pri rastlinah kot tretja raven ekološko informacijskega sistema onesnaženosti zraka. Doktorska disertacija. Ljubljana, Biotechnical Faculty, Agronomy Department. •Krupa S. V., Manning W. J. 1988. Atmospheric ozone: Formation and effects on vegetation. Enviromental Pollution, 50: p. 101-137. •Lesar P. 2007. Spremljanje učinkov troposferskega ozona s plazečo deteljo Trifolium repens 'Regal'. Diplomsko delo. Ljubljana, Biotechnical Faculty, Agronomy Department: p. 23-26. •Mikuš T. 2003. Primerjava poškodb na listih klonov plazeče detelje (Trifolium repens 'Regal') povzročenih od sesajočih škodljivcev in ozona. Diplomsko delo. Ljubljana, Biotechnical Faculty, Agronomy Department: p. 90. •Mills G., Ball G., Hayes F., Fuhrer J., Skärby L., Gimeno B., Temmerman L., Heagle A. 2000. Development of a multi-factor model for predicting the effects of ambient ozone on the biomass of white clover. Environmental pollution, 109: p. 553-542. •Veberič S. 2008. Vpliv troposferskega ozona na nastanek poškodb in izbrane fiziološke procese pri indikatorski rastlini plazeča detelja (Trifolium repens 'Regal'). Diplomsko delo. Ljubljana, Biotechnical Faculty, Agronomy Department: p. 16-20.